Preheat grill for 10-15 minutes. Brush a dash of olive oil on each side of the crust. Grill crust 2-4 minutes on each side. Remove from grill. In a bowl, mix sautéed baby spinach, garlic, olive oil, and salt and pepper. Mix thoroughly and spread on crust. 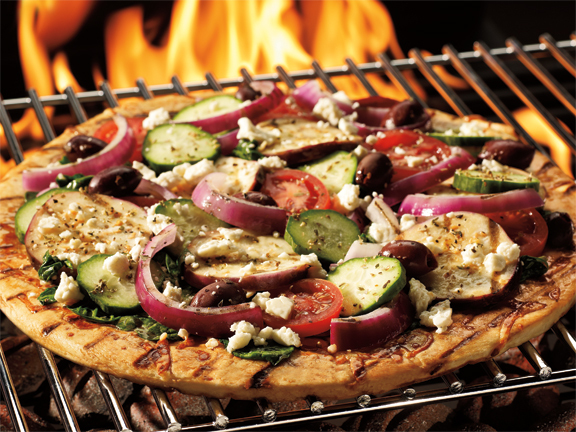 Place grilled eggplant, grilled red onion, cucumber slices, tomato slices, and Kalamata olives over crust. Add the feta cheese. Place pizza back on grill to warm for 8 – 10 minutes or until cheese is melted. Season with oregano. Slice and serve.